The task of religion is to remind men and women of the eternal in the time-bound. The task of metaphysics is to ground religion itself in the ocean of the Infinite and the Absolute. These two tasks constitute the realm of the sacred for humankind. As Stratford Caldecott has reminded us in his insightful article in Sacred Web 4, his Holiness, Pope John Paul II wisely counsels the Christian tradition (and by implication all faith traditions) to reroot itself in traditional metaphysics. Nothing is perhaps more crucial for the survival of the sacred in the post-modern climate of deconstruction than a full fledged recovery of that which has been so tragically lost in the West and hidden for too long, the corrective framework of a fundamental metaphysic. Pope John Paul II’s insight into the necessity and urgency of the rebirth of metaphysics is indeed critical if there is to be clear and honest collaboration between faith traditions as they speak to the common spiritual needs of contemporary humanity. The answer that Caldecott gives, while dedicated to a full metaphysical recovery, seems to leave out (or to forget) major aspects of the very foundations upon which such a recovery within the Christian tradition is possible, namely Christianity’s wider, theological and metaphysical roots in the apophatic and cataphatic traditions of the Patristic Age and the Corpus Areopagiticum.2 The premises upon which Caldecott builds are too narrowly defined because they are based almost exclusively upon a medieval, Scholastic, neo-Thomistic (and thus Aristotelian) worldview that is exclusive to western Christianity. These metaphysical foundations (which he later calls “orthodox Thomism”) have either forgotten, denied or distorted the earlier Patristic and Orthodox contributions to Christian theology (as well as the metaphysical formulations of the Dionysian tradition) which are its balance and corrective. This is a serious error from a Traditionalist perspective (i.e., the tradition of the Philosophia Perennis), but also a mistake if viewed from the theological horizons of the entire Christian tradition. If we are to reestablish a comprehensive metaphysic adequate to our age and strong enough to meet the requirements for renewed metaphysical foundations, then it must draw from the totality of the Christian tradition, and not limit itself to one particular division of it. It must also authentically represent the insights of both eastern and western Christianity, Patristic, medieval and modern thought, Orthodox and Catholic, and not limit itself to the single vision of Thomism, as important as that is to the overall reconstruction. It is the purpose of this article to outline the issues and arguments raised by Caldcott against Traditionalist metaphysics and to examine them in light of the wider scope of the Christian tradition. In doing so, an attempt will be made to answer his objections from within the hermeneutic circle of Christianity itself. Apart from a number of difficulties he finds with traditional and Traditionalist writers (St. Gregory of Palamas, Schuon, Nasr, and Sherrard), Caldecott’s central concern is focused upon two major issues: the incommenserable difference or distinction between the creation and the Creator, and the doctrine of the Trinity as a metaphysical first principle against which all other metaphysical principles in all other faith traditions must be judged. Underlying these two concerns, however, is another more onerous difficulty, a core premise at the heart of Caldecott’s argument. In his article he explicitly reinstates a formulation expressing a viewpoint held in certain circles of Catholic Christianity, namely; “that Christ alone saves,” and “outside the Church there is no salvation.” While certainly a traditional position expressing what some Catholic thinkers and theologians believe to be infallible dogma, even in Catholic Christianity these sorts of statements have been mitigated (if not repudiated) by the correctives of Vatican Council II as being unworthy of both the Christian faith and its deeper understanding of the scope of sacred truth.3 It is virtually impossible to engage in any productive exchange of metaphysical principles in such an environment as long as the issues at hand are prejudged in this way, or without the benefit of a larger metaphysical perspective. Although Caldecott does not go on to argue this position (merely stating it as a principle underlying his criticism), for the purposes of this article it is important to address the issue briefly. From a metaphysical point of view, what appears to be an exclusionary and exclusivist statement (supported in part by biblical injunctions and traditional dogma), is not incompatible with the wider positions taken by ancient and modern metaphysicians. One can argue this case both from within the Christian tradition itself on the basis of the early Patristic vision of the Logos (divine manifestation), or from a metaphysical point of view outside the boundaries of Christian dogma per se. For example, on the basis of metaphysical principles (represented by the designations of exoticism and esotericism within religious tradition), the dogma stated by Caldecott serves to illustrate an aspect of “The Limitations of Exoterism.”7 These statements of exclusion represent an exoteric (and thus, relative) point of view, exclusive to a particular religious tradition (namely Christianity). Nonetheless, that relative statement concerning the condition of salvation, is a religious universality indispensable to the totality of metaphysical Truth which must be given symbolic expression (as it does in Christianity through the dogmatic and theological definitions of the Church, or the Mystical Body of Christ). Schuon goes on to explain, then, that: “The Redemption is an eternal act that cannot be situated in either time or space, and the sacrifice of Christ is a particular manifestation or realization of it on the human plane; men were able to benefit from the Redemption as well before the coming of Jesus Christ as after it, and outside the visible Church as well as within it” (Transcendent Unity, 20). At the heart of Caldecott’s concern is, as he has expressed it, the issue of the relationship between traditional metaphysics and theology. He correctly states Schuon’s view that “theology (based on revelation) transcends philosophy (based on reason, but equally metaphysics must transcend theology.” For Caldecott this cannot be true, and he formulates his objections using the examples of creaturely incommensurability over against the Divine Reality, and Trinitarian theology to challenge this Traditionalist perspective. Sadly, however, theology cannot make statements concerning Ultimate Reality without resorting to either/or statements as conceptual pairs expressed as paradox. Either God is this…, or God is that…, and one must choose between them. From the position of cataphatic theology, one expression must be right and the other wrong, and on that basis one can attain precision theologically. Apophatic theology warns us against such an approach and transcends theological paradox by recognizing the contingent nature of theology with its linguistic limitations, and moving us (especially the theologian) to a position which acknowledges that no formulation, no matter how critical is ever adequate to the divine Reality itself. As an approach to Ultimate Reality, apophatic theology is an authority that eludes both theological and methodological formulation. In its attempt to communicate itself, typically it describes a bipolar unity, transcending both poles in a form of oneness, holding to the insight of non-duality at the heart of a Traditionalist metaphysic.13 Any positive theological statement (including Trinitarian doctrine) is always and only an approximation, and thus in some sense, must be held with the care that is taken with any contingency. It is with such care that we approach Caldecott’s objections to a Traditionalist metaphysic in light of Trinitarian theology. There has been continuous debate throughout the ages as to the precise definition of the Trinity. Does it fall into the category of apophatic theology in which case it becomes a metaphysical first principle, or should it be understood (along with all other dogmas) under the aegis of cataphatic theology and therefore, it too, an approximation of unknowable Reality transcendent to itself? Worthy Christians, scholars, and theologians have debated and disagreed about the answer to this question. Caldecott has made a case for the first position. Many traditional theologians disagree, and have made a strong and convincing case for the second. Caldecott’s argument for the former is based upon his objection to Schuon’s assertions that the doctrine of the Trinity falls under the category of an upaya and that Christian theology “almost inevitably confuses three distinct planes of reality—the undifferentiated Essence, the divine relativity or Personality, and cosmic Relativity.” Using Meister Eckhart as his point of reference, Caldecott critiques the notion the “Godhead” (or that the Trinity involves any form of procession from the Godhead). It is not altogether clear whether or not Caldecott accepts the notion of “degrees of reality,” but what is clear is his rejection of the idea that the Godhead is the highest hypostasis (or beyond hypostasis altogether) if it does not refer explicitly to the Trinity. For him Trinity and Godhead are the same. This understanding is one important aspect of Patristic and Dionysian theology (and part of its underlying metaphysics), and sees, therefore, the Trinity (manifesting the central mystery of the divine essence) as the first procession (or manifestation) out of that which is unknowable or super-essential (beyond essence) in God. It is also understood in precisely this same way by important medieval and modern Catholic theologians whose orthodoxy is not in question. The above statement by Rahner contains a phrase which leads us to an examination of Caldecott’s other objection to traditional metaphysics, namely, the issue of the “otherness” of creation in relationship to the Creator (the ontological gulf separating God and the creation). Rahner notes, however, that as the abiding and holy mystery, God is also “the incomprehensible ground of man’s transcendent existence.” This statement represents another antinomy (a paradox of opposites) which must be held together if one is to maintain metaphysical balance and also remain true to the scope of the Christian tradition itself. In Caldecott’s view, the one side of the antinomy (the otherness of the creation and the creatures) requires us to deny the second side of the paradox, that humans are also, and at the same time as their radical otherness, intrinsically divine, for their origin and template is nothing less than the Divine Reality itself. Christianity, of course, speaks first of the Incarnation of God, of God’s descent (katabasis) into the world in order to give humanity that possibility of communion with God which has been closed for so long. Yet, it also speaks of the fact that humans are made in the image of God, and so the soul’s search for God is naturally conceived as a return, an ascent (anabasis) to God; for the soul properly belongs with God. In its ascent it is but realizing its own true nature hidden in God from eternity. All of this is expressed in the double doctrines of kenosis and theosis which have been at the heart of Christian tradition.22 These movements, ascent and descent (kenosis and theosis), cross one another, and, as a fact of human experience, remain in constant tension. There is a co-operation of the divine and the human, the uncreated and the created. Christ is the perfect man, the complete man, the whole man. But Christ is also God. This is to say that, paradoxical as it may sound, it is God alone who is the perfect man. Only God is completely and utterly human. As we said, in so far as man fails to realize the divine in himself, to that extent he falls short of being completely human. He remains less than human. His human nature is truncated just as the divine nature is truncated…Not to penetrate into the realm of the divine is for human nature to be frustrated and crippled at its most real and creative centre. It is for human nature to be distorted at its roots. Man’s failure to live according to a divine mode is a form of self-mutilation. Once again, Christian orthodoxy requires this tension in order to sustain the paradox in the context of a sacred anthropology. It is precisely this tension that the exponents of traditional metaphysics also wish to express. They are doing nothing less than acknowledging the requirements of the totality of Christian revelation necessary for the transformation of humanity. Far from “outgrowing the proclamation of the Church,” as Caldecott suggests, they are protecting it. Luciferian Pride or Metaphysical Safeguard? Caldecott insinuates that in their desire to preserve the paradox Traditionalists have fallen prey to the “final temptation” of Luciferian pride. Might it not be instead that they are practicing a form of metaphysical defense against the destruction of Sacred Tradition itself not only from without, but also from within? Finally, in regards to both of the main objections that Caldecott raises we see that we are in the presence of antinomic theology which must proceed by a coincidence of opposites (coincidentia oppositorum) through equally true but opposing propositions. It is an attribute of orthodox theology that it wishes to respect both sides of this opposition, knowing that both affirmations are true and necessary to the divine economy. This approach is clearly a violation of reason, which wants to reduce the tension by disclaiming one side or the other (which is also the historical basis for all traditional designations of heresy). In the pursuit of a strong metaphysical recovery as a renewed basis for Christian theology it is critical that we persevere this equilibrium. In order to move from phenomenon to foundation and not lose contact with revealed realities (replacing them with concepts that reflect less than the whole of the tradition) we must be vigilant and maintain all aspects of the antinomy. It is only in this way that we can sustain and support Caldecott’s good intention, the rebirth of Christian metaphysics. 1 In Vatican Council II: The Conciliar and Post-conciliar Documents, Nostra Aetate, 28 October, 1965, “Declaration on the Relation of the Church to Non-Christian Religions,” (Northport, NY: Costello Publishing Co., 1979) the following declarations from the Council are made: The Catholic church rejects nothing of what is true and holy in these (non- Christian) religions. She has a high regard for the manner of life and conduct, the precepts and doctrines which, although differing in many ways from her own teaching, nevertheless often reflect a ray of that truth which enlightens all men. Yet she proclaims and is in duty bound to proclaim without faith, Christ who is the way, the truth and the life (Jn. 1:6). In him, in whom God reconciled all things to himself (2Cor. 5:18-19), men find the fulness of their religious life. The Church, therefore, urges her sons to enter with prudence and charity into discussion and collaboration with members of other religions. Let Christians, while witnessing to their own faith and way of life, acknowledge, preserve and encourage the spiritual and moral truths found among non-Christians, also their social life and culture (739). 2 At the beginning of the sixth century, the Christian community began to be aware of a collection of writings, the Corpus Arepagiticum (or the Areopagitical Corpus) said to come from the hand of Dionysius (or Denys) the Areopagite. These writings assumed to be from an early disciple of the Apostles are considered by most scholars today to be the work of a fifth century Syrian monk familiar with Platonic and neoplatonic metaphysics. This expression of the Sophia Perennis in a western mode was embraced within the Christian unfolding of its metaphysical and theological understandings and exercised a profound influence upon Christian theology from that day into the present. For a comprehensive overview of this tradition and its influence see two volumes by the contemporary scholar, Andrew Louth, Denys the Areopagite (Wilton, CT: Morehouse-Barlow, 1989), The Origins of the Christian Mystical Tradition: From Plato to Denys (Oxford: Clarendon Press, 1981), and the Classics of Western Spirituality series’ Pseudo-Dionysius: The Complete Works (Mahwah, NY: Paulist Press, 1987). 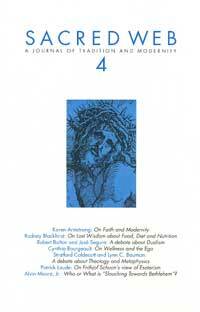 4 Philip Sherrard, a contemporary Orthodox theologian argues, for example, that: “The magnificent scope of the Logos doctrine with its whole ‘cosmic’ dimension—the idea of God incarnate in all human and created existence—which from the time of the Alexandrians and Capadocians down to the present day has been one of the major themes of Orthodox Christian theology, was tacitly but radically constricted in Western thinking. Spontaneous personal participation ‘in Christ’ became identified with membership of a juristic corporational institution which claimed to be the unique sphere of the Spirit’s manifestation, the judge of His presence, and the manipulator of His activity” The Eclipse of Man and Nature (West Stockbridge, MA: Lindisfarne Press, 1987, 106). 5 St. Augustine, for example, states: “That which today is called the Christian religion existed among the Ancients and has never ceased to exist from the origin of the human race until the time when Christ Himself came and men began to call Christian the true religion which already existed beforehand” (Retract. I, 13, 3). 6 Frithjof Schuon, for example, explains that many statements made concerning Christ confuse “ the historical with the cosmic Christ and represent(s) an eternal function of the Word as a temporal fact, for the simple reason that Jesus was a manifestation of this Word (Logos); which is another way of saying that in the world where this manifestation took place, Jesus was truly the unique incarnation of the Word. (The Transcendent Unity of Religions, NY: Harper and Row, 1975, 120). 7 This position is ably argued by Frithjof Schuon in his seminal text, The Transcendent Unity of Religions (NY: Harper and Row, 1975, 7-30). 8 For a comprehensive explication of this traditional Christian understanding see Vladimir Lossky, In the Image and Likeness of God (London and Oxford: Mowbrays, 1967) and The Mystical theology of the Eastern Church (Crestwood, NY: St. Vladimir’s Seminary Press, 1976). Also see Andrew Louth, The Origins of the Christian Mystical Tradition: From Plato to Denys (Oxford: Clarendon Press, 1981). 9 Gregory of Nyssa and other of the early Church Fathers understood the function of cataphatic theology to be a “ladder of theophanies” disclosing the divine names which draw the soul in a series of steps to the summit of the mountain of pure contemplation (Con. Eunom., P.G., XLV, 939-41). 10 Oratio XXVIII (theol. II) 4, P.G., XXXVI, 29-32, The Five Theological Orations of Gregory of Nazianzus, Cambridge, 1899, 26. 11 De Vita Moysis, P.G., SLIV, 377 B., from Sources chretiennes, Paris, 1955, 82. 12 Vladimir Lossky, The Mystical Theology of the Eastern Church (Crestwood, NY: St. Validmir’s Seminary Press, 1976, 25) quoting Dionysius from Ep. I., Migne P.G., III, 1065. 13 It is the contention of many scholars, included among them Christian scholars, that it is precisely Thomistic theology that seeks to blur the distinction between the two traditional approaches to theology by reversing them, and thus to collapse them into a single theological formulation. For example, Vladimir Lossky says, “For Thomas Aquinas, for example, the antinomy of the two theological ways does not exist; the positive and negative ways can and ought to be harmonized or, rather, reduced to a single way, that of positive theology; the negative way then would be nothing more than a complement, a corrective to the positive way, which would simply indicate that all affirmations touching the nature of God ought to be understood in a more sublime sense (modo sublimiore)” (In the Image and Likeness of God, 53). 14 It is Dionysius who insists on the integrity of the divine processions on each level of participation, speaking of them in the singular as “the ray.” According to the Dionysian tradition the Divinity is fully manifested and entirely present in each of the processions (dunameis), through which created beings can only participate in proportion (or analogically) to their proper degree in the cosmic hierarchy. (Vladimir Lossky, In the Image and Likeness of God (London and Oxford: Mowbrays, 1967, 41). 15 De fide orthodox, I, 4, P.G., XCIV, 800 BA. 16 Theophanes, P.G., CL, 937 A. 17 Quoted in Willigis Jager, Search for the Meaning of Life: Essays and Reflections on the Mystical Experience. Liguori, Missouri: Triumph Books, 1955, 59. 18 Karl Rahner (ed.) Encyclopedia of Theology: The Concise Sacramentum Mundi (NY: Seabury Press, 1975, 1757). 19 Karl Rahner (ed.) Encyclopedia of Theology: The Concise Sacramentum Mundi (NY: Seabury Press, 1975, 1766-1767). 20 For a complete explication of Schuon’s understanding of the degrees of divinity (or hypostases) see: Survey of Metaphysics and Esoterism (Bloomington, Indiana: World Wisdom Books, “Dimensions, Modes and Degrees of the Divine Order” 25-36, and “The Mystery of the Hypostatic Face” 91-102). 21 Karl Rahner, Foundations of Christian Faith: An Introduction to the Idea of Christianity (NY: Crossroad, 1982, 137). 22 These two traditional Greek terms used in the Christian tradition are expressive of the interior process by which the restoration of humanity is completed. The first, kenosis, denotes the emptying-out and purification that takes places as the underlying basis of the redemptive process. It would be signified by the symbol of the cross and crucifixion. The second, theosis, expresses the process of restoration to fullness of being in God symbolized by resurrection and ascension. 23 Philip Sherrard, The Eclipse of Man and Nature. (West Stockbridge, MA: Lindisfarne Press, 1987, 22, 27-28, 29).